A Chocoholic's Gift Guide | gingerbread smiles. I think we are all guilty of eating too much chocolate, especially during the festive period but there are some of us who take this too seriously. They are the chocoholics. I'm sure you know one. Someone that can't go a few hours without a bar of chocolate. These gifts are for them. A luxury gift for someone special who loves chocolate but also appreciates alchohol. This Hotel Chocolat box of chocolates will definitely make someone happy this Christmas. Again a boozy present for the chocoholics, this time something they can drink. Chocolate and wine, the perfect perfect pairing. As much use as a chocolate teapot. Well this one is useful if you're hungry for chocolate. Especially warm melted chocolate. Mmmm. This is a quirky gift for friends and family which will definitely get people talking. A fun game for those daredevil chocoholic friends of yours. Just make sure to drop the gift and leave so you aren't coaxed into playing it. I've heard the chilli chocolate bullet is extremely hot! A whole pizza made of chocolate. That is the stuff of dreams. This present would be great for kids and adults alike. A great present for friends who aren't keen on their vegetables but do love chocolate. They are very like their vegetable counter parts but made entirely from chocolate. 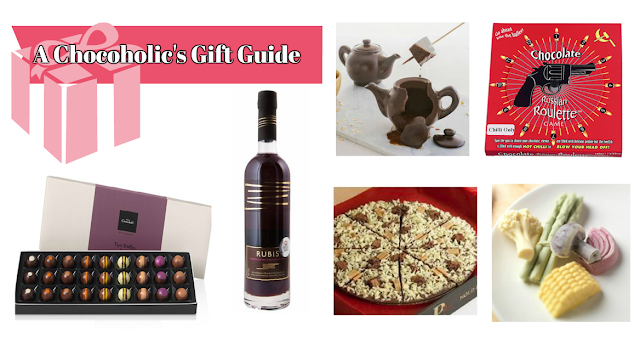 I hope you enjoyed this round up of chocolate gift ideas. If I haven't already persuaded you to make a purchase of at least one of these gifts for yourself... then I hope this inspires you for your Christmas gift shopping! Did you see yesterday's gift guide for dog lovers?